If evil is recognized easily, then Satan would not have truly wanted resemble his Creator, Yahweh. It would (evil) be like it is portrayed in books and movies. But this is not the case, because true evil started with Satan by rebellion. Other evil sprang off of that rebellion. You recognize mankind’s treacherous evil by the criminal class, but few recognize the evil Yahweh views from those that feel they are not evil, yet in Her eyes are every much as evil as those that commit horrendous crimes. And this why Yahweh inspired this Scripture: Hebrews 5:14 “But solid food is for the mature—for those whose senses have been trained to distinguish between good and evil.” So, can you “distinguish between good and evil” or do you follow the pattern laid out early on by the Original Rebel – Dawn Lucifer that became the Father of all that’s evil? Claiming to be godly, showing a form of devotion, but not observing Yahweh’s truth in all matters – spells that you are marked as EVIL. If you do not believe Yahweh is here to deliver those of Her remnant, and destroy those that are not marked for salvation leaves you in the unmarked for salvation class. Where do you stand at present? With Yahweh, or with Satan’s last ditch effort of a stand to try and win this war? Satan wants his family with him, but do you want to remain with him and follow his train into the pit of oblivion? As always, the choice is individual. Evil is repayment for evil incurred against Her authority. And eye for an eyes…tooth for tooth….. It is under Her Judicial Law that evil is administered as repayment. Kind for kind. Only Yahweh has the power to administer evil in repayment through Her loyal army of dedicated deputies and warriors. This why Yahweh says: “Vengeance is mine.” It belongs to Her as the Ruling Authority to bring calamity upon those that are evil and unjust. 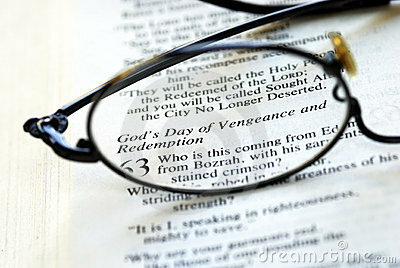 Evil has its place, but must be just in Yahweh’s eyes as a repayment for evil performed against Her law. It all started with “Good and Evil. ” Its knowledge of – what it means to know and understand that concept. Yahweh can be both, simply because She is our Creator. But is only evil in connection with righting wrongs under Her law. This entry was posted in Evil, Good and Evil, Vengeance, Yahweh and tagged Good and Evil, Vengeance Belongs to Yahweh, Vengeance is God's. Bookmark the permalink.